campfire bannock recipe | i made it so. on a recent camping trip, we made bannock. it’s a very basic bread dough which we wrapped around sticks and cooked over the fire. the nice thing about it is that it can be prepped ahead of time, and then once you’re at camp, you just add water to make the dough. 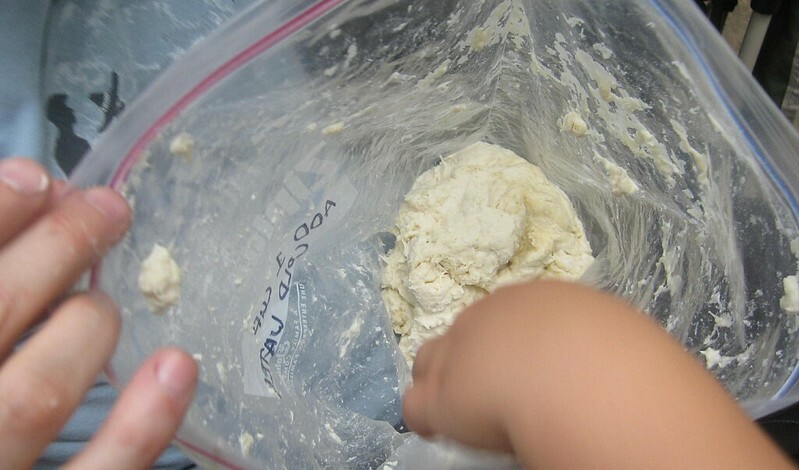 seal the bag and massage this mixture from the outside of the bag until it is crumbly. keep refrigerated or in a cooler/on ice until you’re ready to use it. to make the bannock, just add water to the bag of ingredients. about 1 to 2 cups, just enough to make a sticky dough consistency that you can work with your hands. 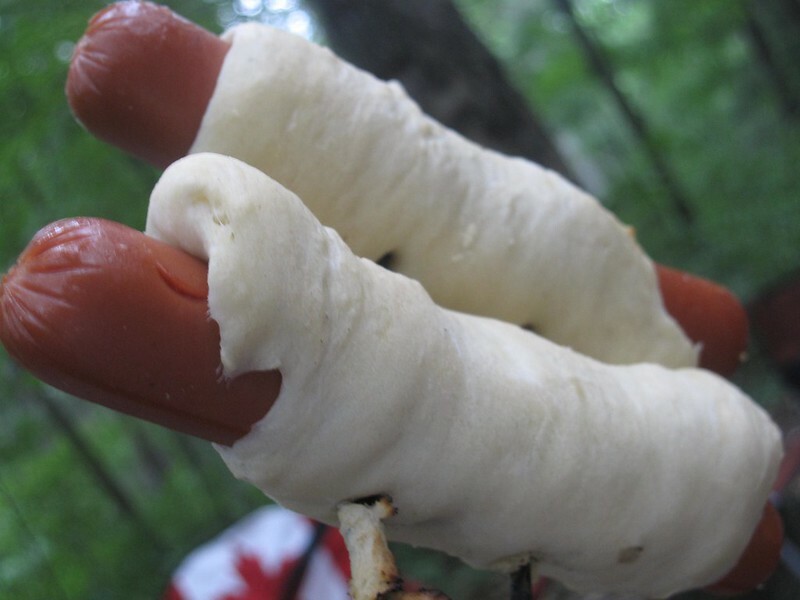 or a flat piece can be wrapped around a hotdog to be roasted over the fire (for that, i’d recommend cooking the hotdog first, then wrapping it with the dough. i found that the bannock cooked quicker than the hotdogs). 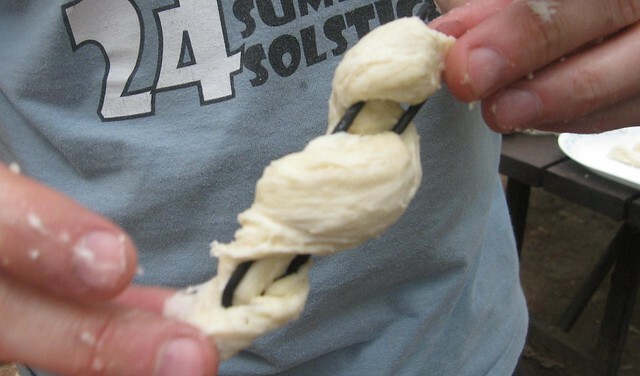 we’ll be trying this one again, the kids thought it was fun and honestly… it was delicious. but then, everything tastes better when made over a fire, don’t you find? have you ever made bannock? if you go camping, what are your favourite things to make? This entry was posted in in the kitchen, kids made it so, tools, tips and techniques and tagged bannock dough recipe, bannock hot dogs, bannock made over a fire, bannock on a stick, bannock recipe, bannock recipe for camping, camping bread recipe, make ahead camp recipe. Bookmark the permalink. thanks abby, it’s a fun one! This is looking good, Ana! We’ll definitely have to try this at our next backyard bonfire! :) Hope you are having a wonderful summer! in case you didn’t notice by the slow pace of things around here… we are *definitely* in summer mode! i love it. hope you’re enjoying your summer too. Pingback: homemade granola bars | i made it so.